The early years are a special time of innocence and wonder that we never get back. That’s why I always wanted my kids to have an opportunity to explore the world in their own ways and to learn freely. I also didn’t want their thinking to be influenced by the Disney channel, TV commercials or video games, so no computers and very little (supervised, commercial-free) TV time for my kids. But we live in a world of technology and at some point it has to be introduced into their life. That’s why, some time after my oldest turned 7, I started (occasionally) to use youtube videos and educational DVDs from a library to expand on the concepts we were working on. And on the brink of his 8th birthday, I finally got ready to introduce him to his first online educational program or ideally two: one for reading and one for math. But which ones would be good enough for my high standards? Lucky for me I’m part of the Schoolhouse Review Crew and get a weekly opportunity to explore new educational products. So, after some consideration I gave my heart to: Read, Write & Type by Talking Fingers Inc. for reading and another program for math (review is coming up). Read, Write & Type is an online program designed for kids ages 6-9 that integrates phonics, reading, spelling, writing, and keyboarding. I was intrigued when I read that it uses a multi-sensory approach based on 20-years of neuropsychology research. In other words, it works because it takes into account how a young brain learns. 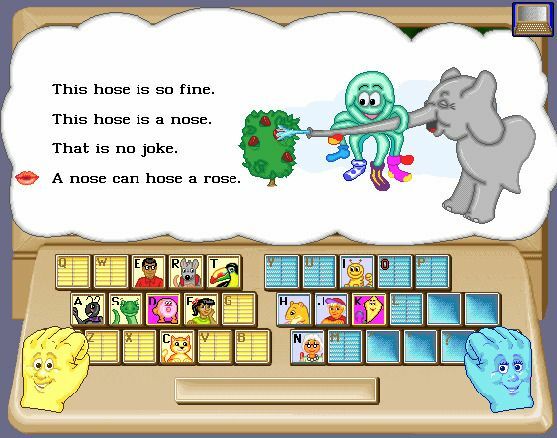 It’s multisensory, because in this program kids sound out the word (mouth), type the keys (touch), see the letter appear (eye), and hear the computer say the sound (ear). If “text is a speech made visible” then by linking speech sounds with keyboard strokes, kids can write any word they say. Their fingers are “talking.” It all sounded very fascinating and I couldn’t wait to try it with my son. I was provided with a complimentary one-year subscription to Read, Write & Type. 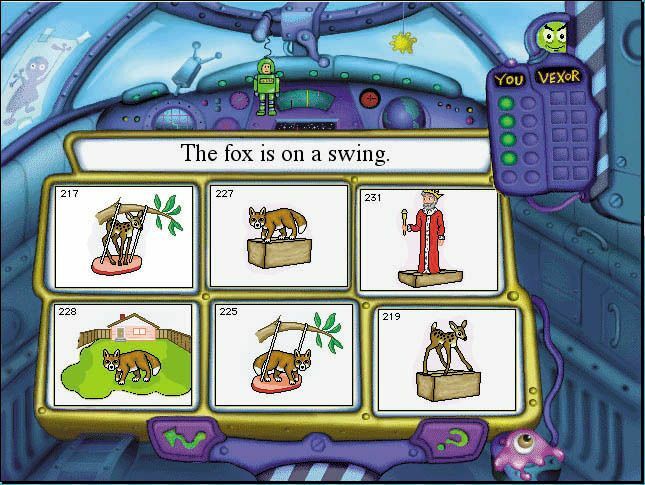 In this program, a mischievous computer virus named Vexor is trying to steal the letters and prevent kids from writing down their stories. 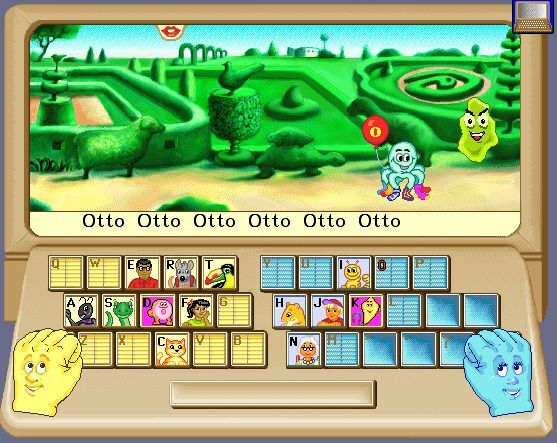 Lefty and Rightway, the helping hands, are friends for the ride that guide kids through 40 levels of exciting adventure. The colorful animated characters, songs, and music fill the adventure with action and spirit. Check out a demo here. Each letter or sound (i.e. th) is introduced one a time. Kids first meet the character behind the letter/sound, and link the sounds to the letter and to the keyboard stroke. Then, kids go through some learning activities that strengthen their understanding. For example, kids look at the pictures and type in the beginning, middle or ending sound of the word on the picture. (E.g nose, red, three, cook, … ) Or they need to read three sentences (i.e. A cat has a fan. Nana has a disk. Fadasa has a fan) and then click on the sentence that belongs with the picture. On the next level, kids are presented with a picture and asked to type the word they hear. They can click a button to hear the word again and again until they can break the word into sounds and spell it out. My kids enjoyed the activity whey they had to read a sentence and click on the picture that goes with it. Later kids are shown sentences for a brief time, then it disappears and kids are asked to type it on their own. They also write letters to their pen friends and read replies. The three level of typing practice are made exciting by having mean Vexor blow away the types material if kids don’t get to the end before the character reaches the destination. Kids are asked to type first the letter of the day (say K), then short word (kick), then a word combo (Kat kicks). By the end of the course, kids sound-out, spell, and read hundreds of words, sentences, phrases. My almost 8-year old (seems wrong to call him 7-year old, but he is not 8 till May) ended up using the program together with his siblings. I wasn’t happy about my youngest staring at the computer screen, but there is simply no way to keep kids separated. The good thing is that once the novelty wore off my youngest found a way to get back to his toys. We used it 3-5 times a week. My 5-year old who is actually at about the same reading/spelling level as my almost 8-year old was a very good fit for this program as well. Kids took turns typing in the answers. It took about 15-20 minutes to cover one lesson. I turned the program on and stayed close to answer the questions or help them with typing. I’m really impressed with this early writing and spelling program. My kids were not that excited about it when we just started, but they quickly changed their minds. “Can’t we just watch sea cucumber video, please,” they asked repeatedly during the first lesson. Once they realized that they would not be watching any videos, they got into the spirit of adventure. They laughed, typed, gasped when Vexor got the upper hand, and generally had fun with it. They always wanted to keep going after the lesson was over and acted very disappointed when I turned the computer off. Somehow things that were boring in print became exciting once they were on a computer screen. For example, many times in the past few years we did exercises where kids had to name the beginning, middle or end sound of words and they kind of grumbled when I asked them to do it. But in this program the same exercise became exciting because it was animated and they could type in the letter or press space. And they even bickered a little bit about who would have the privilege to type the letter and who would have the privilege to click “space” button. 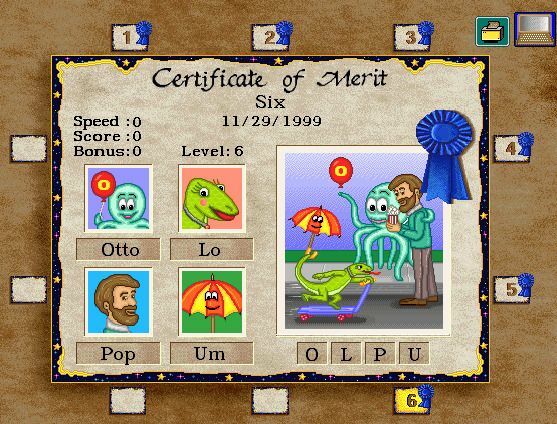 At the end of every four letters/ sounds kids could print out Certificate of Merit. I didn’t think it would be such a huge deal, but my daughter coveted these certificates. It was a big motivational factor to keep going because she wanted to get another one. My son couldn’t care less. His motivation was to beat Vexor and spoil his plans. If Vexor didn’t want him to save the letters, then he just had to do everything in his power to foil his plans. It was not a kind of program where I could turn it on and walk away, but I think that is mostly because my kids are used to doing all their schoolwork with me. They wanted to share their thoughts, asked my opinions, and if they couldn’t type fast enough and letters kept getting blown away by Vexor, they asked me to type it for them to get to the next level. I really like the idea of teaching kids to type correctly from an early age. I’m a really fast typer. I type with the speed of thought without looking at the keyboard and it always came very handy in life. However, it was hard to reinforce the correct finger placement. My kids just wanted to type everything with the index finger including the space bar. At first I was fighting this tendency, then I just decided that they are not ready and gave it up. In sum, it’s an engaging and fun online program that integrates reading, writing, spelling and keyboarding. It’s based on peer reviewed research and offers great learning opportunities. Both my older kids enjoyed using Read, Write & Type and we will definitely finish the whole program. Still not sure, Talking Fingers Inc. is for you? Try out this interactive DEMO. Hey Buddy!, I found this information for you: "Read, Write & Type (Talking Fingers Inc. Review)". Here is the website link: http://kidminds.org/read-write-type-early-writing-spelling-program/. Thank you.